But, there were things about the dream, symbols, that I noticed. For instance, there were pine trees outside the window and pine cones and needles all over the ground, things like that. But, the thing I remember most was that in that house, I felt the most unspeakable joy. My rational mind struggles with supernatural experiences like this, but the memory is so real to me, the joy was so potent, that I can bring it back to me if I concentrate. I can remember it better than any real memories I have of things that happened to me during my waking hours. These powerful dreams have served me in a few ways through the last few months. They brought me the motivation to continue through the sometimes grueling process of looking for a new home, even though we weren't ever really that eager to move. The dreams also comforted me as I packed and grieved, because I was leaving a place in this world that I cherished. Now the dreams often bring me excitement as I unpack and discover things about our new place. So when I saw a Christmas ornament with pine branches and pine needles, my eyes were drawn to it and I thought of my dream again. That ornament was in a pair with the ornament shown in the picture above. 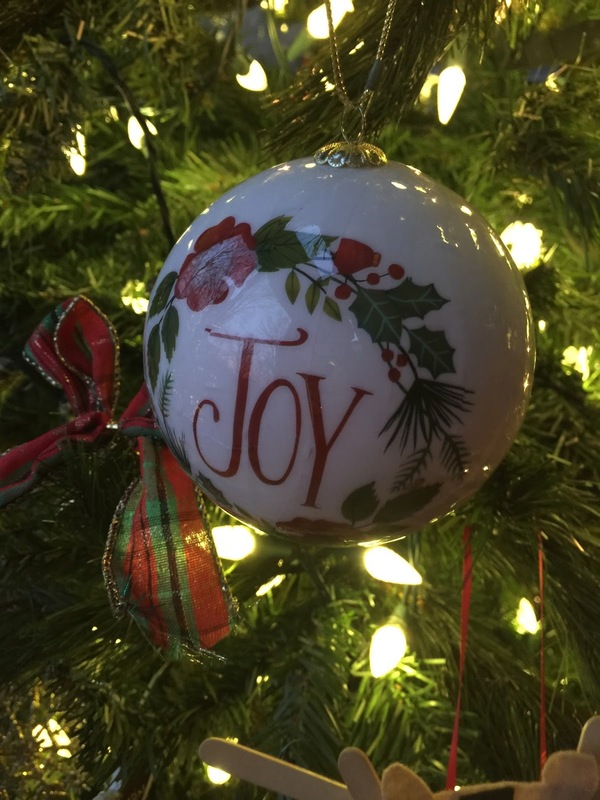 When I saw the word, "Joy," on the side of it, I just smiled and decided that I had to buy these ornaments for my tree this year. Near those ornaments were others, too, that made me think of my new home: a swede cardinal, wooden binoculars, a wooden camera, a flannel backpack, and a wooden doll, all bundled up in miniature clothes against the cold, sitting on a tiny, metal snow sled: all things that remind me of our new home this winter, surrounded by trees, birds, hills, within minutes of hiking trails. I know these ornaments will serve to remind me of this significant move year after year and seeing them throughout the day already serves to bring that same joy, unspeakable, and full of glory, right back to the surface.